Scribbling With Spirit: Out of Time? Draw While You Stand Around! Not long ago I had one of those days when I thought, whoa. No time to draw today. I committed last February to drawing every day for at least thirty minutes. I didn't want to blow it just because a bunch of unforeseen circumstances took control of my day. 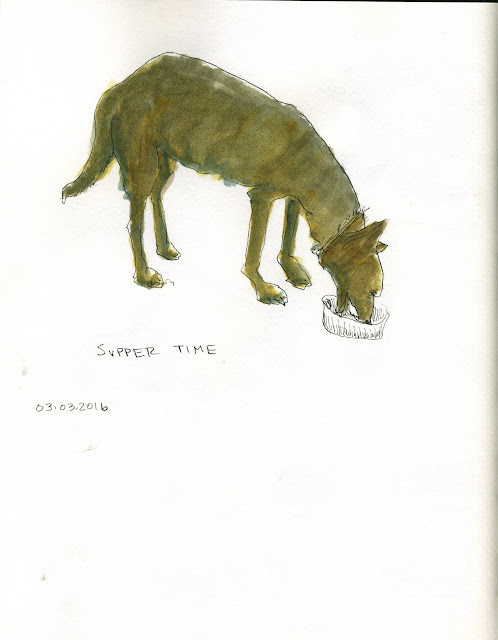 As I headed down to my basement to feed my dogs, it hit me: draw the dogs eating! I have to stand around and watch them anyhow, so no one (namely the cats) bullies anyone out of their food. That would be at least ten good drawing minutes. I only got Nora inked before she finished eating. Both of them ran upstairs for the post-dinner nap ritual, so I followed. I sketched Nik as he fell asleep. 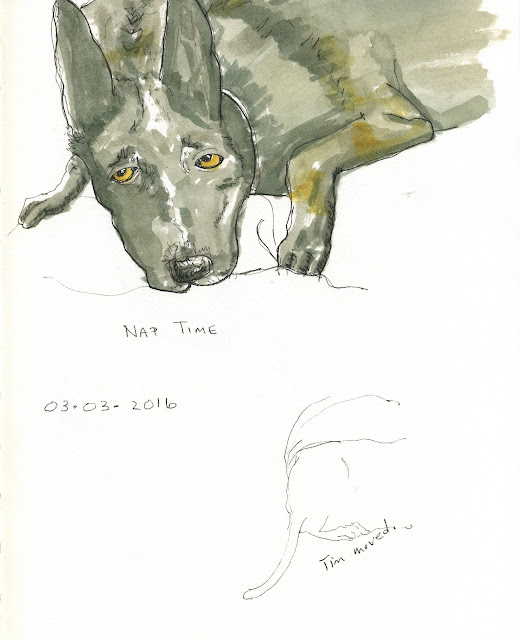 You can see from the unfinished sketch at the bottom that I tried to sketch Tim as he considered a nap with the dogs, but he left before I got much done. Then I got dinner underway and instead of watching the news, I painted my sketches. Good practice learning the watercolors. Some days, you just can't sneak a good scribbling session into the day. But you can sneak some scribbling into the cracks and it can add up to good time and good practice.